Plot : Kingsley’s character is a man pushed to his limits and that he eventually resorts to violent means. The film’s tagline is also as good as a synopsis – “Five bombs in the city. The clock is ticking”. It is more difficult to tell, though, who the creators’ sympathies are supposed to lie with – the loose cannon or the ruthless cop? The audience will find their allegiance swinging from one to the other. 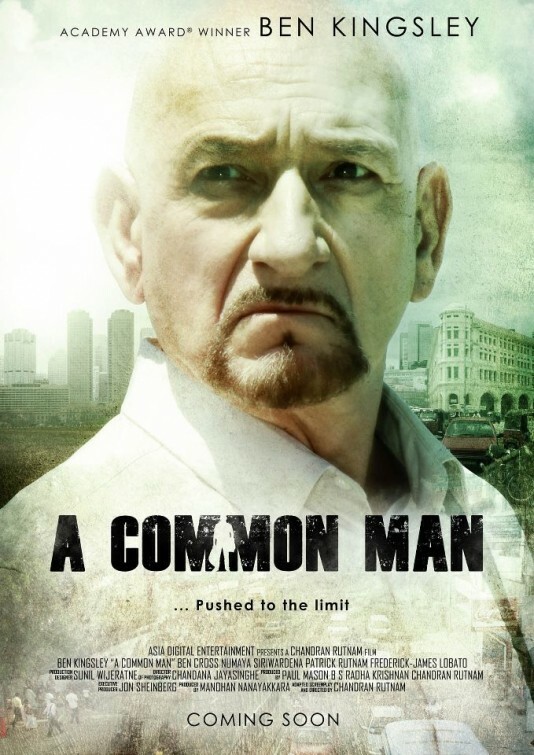 A Common Man is a production of Asia Digital Entertainment which produced the feature film, The Road From Elephant Pass, a Finalist Award winner at the 2011 New York International Television and Film Awards. The film is adapted for the screen and directed by Chandran Rutnam. A Common Man is produced by Manohan Nanayakkara, B.S. Radha Krishnan and Chandran Rutnam. The Academy Award winning Ben Kingsley’s (Gandhi) recent credits include Martin Scorsese’s Shutter Island and Jerry Bruckheimer’s Prince of Persia: The Sands of Time. Other recent projects include Hugo, from director Martin Scorsese, with Sacha Baron Cohen and Chloe Grace Moretz, and The Dictator, which also stars Sacha Baron Cohen. Ben Cross (Chariots of Fire) recently co-starred with John Cusack in the independent film War, Inc. and opposite Cuba Gooding, Jr. and Ray Liotta in Hero Wanted. Other recent projects include Star Trek, directed by J.J. Abrams, and starring roles in the mini-series Ben Hur for the BBC, the mini-series Ice opposite Sam Neill and Lifetime’s William & Kate.